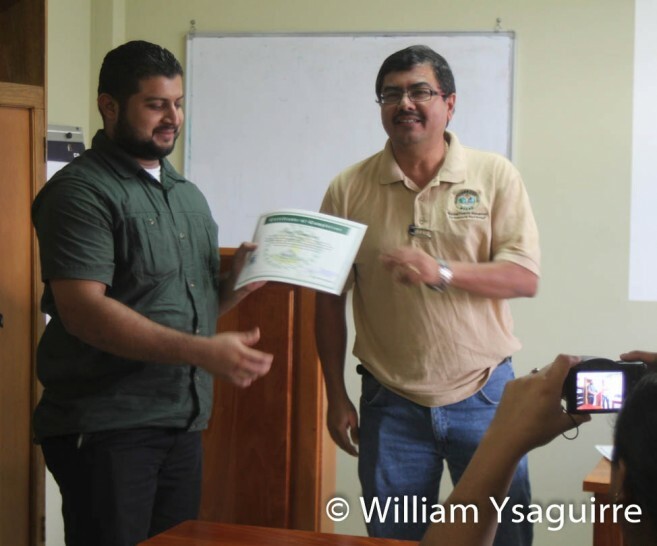 Thanks to the efforts of the Department of Environment (DOE), Belize’s wildlife and environment have been protected from the harmful effects of over 30 tons of Persistent Organic Pollutants (POPs) that have been stockpiled for over 30 years. POPs are recognized as causing adverse effects on humans and the ecosystem, and include toxins such as pesticides, industrial chemicals and industrial by-products. A Greek firm, POLYECO, has been contracted by DOE to remove these pollutants from Belize and to destroy them safely by burning them in France. The DOE hosted a training workshop at the Belize Biltmore Plaza Hotel in Belize City last Thursday, February 9th, where POLYECO’s representative George Chrysanthopoulus instructed 44 participants in the proper handling and disposal of such dangerous toxic substances. The workshop participants included Forest Rangers, DOE inspectors, members of the Police, Health and Customs Departments, conservation non-governmental organizations, and other interested parties from the private sector. Chrysanthopoulus explained that the only safe, effective way to get rid of these toxins was to incinerate them, which POLYECO will do at its facility in France. 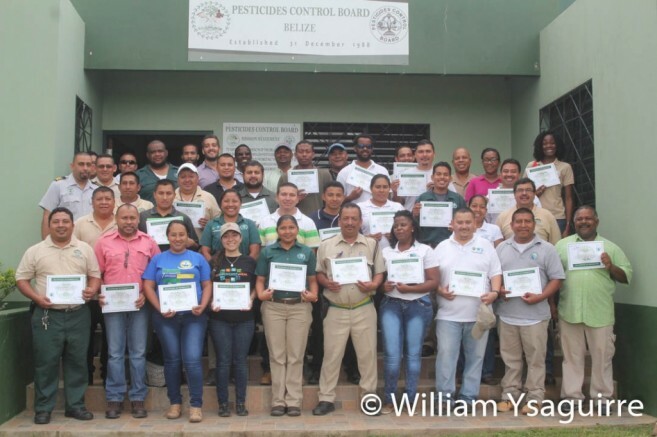 After learning the theory in an all-day session at the Biltmore, the participants repaired to the Pesticide Control Board offices at Central Farm, Cayo district, where they had a hands-on practical experience of managing these substances, complete with face-masks and gloves, on Friday morning, February 10. Chief Environmental Officer Martin Alegria explained Belize has no safe way of disposing of these toxins, so the DOE employed POLYECO’s services for about $200,000 to handle, package and ship the chemicals to Europe to be incinerated. 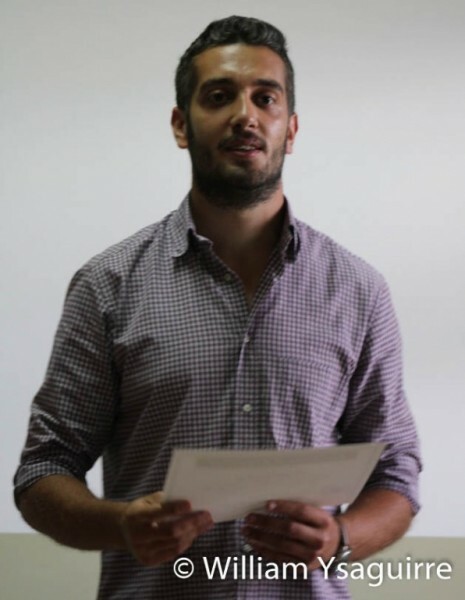 The 44 participants received certificates from Alegria and Chrysanthopoulus on completion of their training. Years ago, one POP insecticide called Dichloro-Diphenyl-Trichloroethane (DDT), was the key to Belize’s successful fight to eradicate malaria when we were still British Honduras, but DDT has been outlawed because of its effects on birds and the environment. DDT and its derivatives have the unpleasant property that they accumulate in the bodies of predatory birds, particularly apex predators like raptors. These chemicals have been found to cause birds to lay eggs with thin, soft shells which rupture before any chicks can be born. This issue was highlighted by Rachel Carson in her book “Silent Spring” in 1962, and the furor it caused resulted in the United States banning all use of DDT in 1972. Yet Belize’s anti-malaria unit within the Health Department still had a stockpile of 24 tons of DDT left over from before 1981, because Belize had no safe way to dispose of it. These 24 tons and other organic pollutants that affect the ozone layer such as Freon are the hazardous wastes that POLYECO will dispose of.